The regular meeting of the Borough Council convened at 7:03p.m. in the Borough Municipal Building, 35 West Railroad Avenue, withPresidentBuchanan presiding. Police Chief, James Boddington, informed the Council that one of the Southern Regional Police officers was the first professional on the scene of a double fatality fire just over the boundary line in the Township. The State Police officer did not arrive until 40 minutes later. Chief reported arrests were made from an August burglary at Market Square due to networking with other police departments in Maryland. 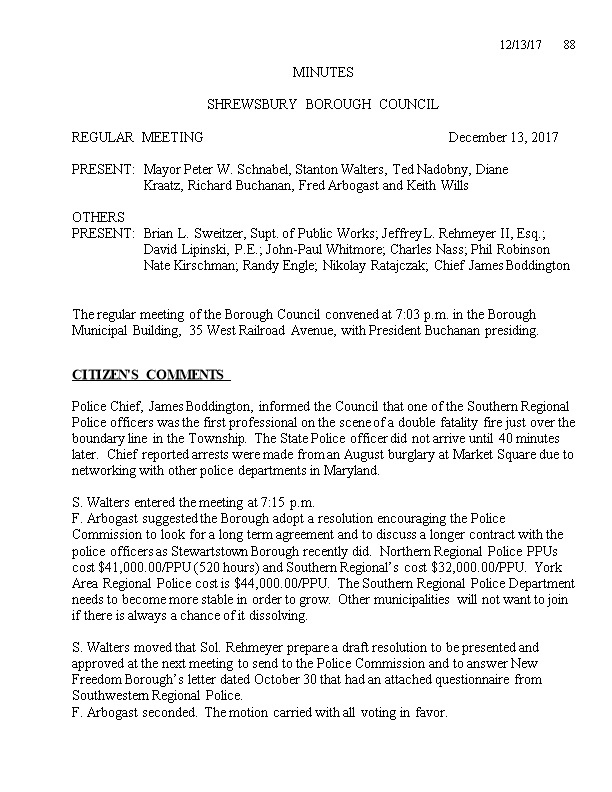 S. Walters entered the meeting at 7:15 p.m.
F. Arbogast suggested the Borough adopt a resolution encouraging the Police Commission to look for a long term agreement and to discuss a longer contract with the police officers as Stewartstown Borough recently did. Northern Regional Police PPUs cost $41,000.00/PPU (520 hours) and Southern Regional’s cost $32,000.00/PPU. York Area Regional Police cost is $44,000.00/PPU. The Southern Regional Police Department needs to become more stable in order to grow. Other municipalities will not want to join if there is always a chance of itdissolving. S. Walters moved that Sol. Rehmeyer prepare a draft resolution to be presented and approved at the next meeting to send to the Police Commission and to answer New Freedom Borough’s letter dated October 30 that had an attached questionnaire from Southwestern Regional Police. F. Arbogast seconded. The motion carried with all voting in favor. Chief Boddington thanked Council and Mayor Schnabel for their support. Chief Boddington congratulated Mayor Schnabel on his last Council meeting and thanked him for his service. The minutes of the November 8, 2017, meeting were approved by unanimous consent. F. Arbogast moved to approve the bill lists: general account check numbers 1803thru 1843; water account check numbers 1311 thru 1326; sewer account check numbers 1192 thru 1203;highway aid account: check number 927; and to approve the financial reports for November. T. Nadobnyseconded. The motion carried with all voting in favor. F. Arbogast moved to approve the November 6 and 20 payroll registers. K. Wills seconded. The motion carried with all voting in favor. The EDU for this parcel is being purchased from Shrewsbury Township. The Sewer Planning Module and PennDOT permits need to be obtained yet. S. Walters moved to conditionally approve the final subdivision for Lot 55 of Eitzert Farms pending approval of the Sewer Planning Module and the necessary PennDOT permits. T. Nadobny seconded. The motion carried with all in favor. The property owner asked for another extension until April 19, 2018. T. Nadobny moved to grant the extension until April 19, 2018. D. Kraatz seconded. The motion carried with all in favor. Six permits were issued in November. Sol. Rehmeyer reviewed the Agreement and suggested that certain language about the Borough indemnifying South Penn Code consultants, LLC be removed. Since it was removed, it is recommended that the Agreement be approved. S. Walters moved to approve the 2018 Agreement with South Penn Code Consultants, LLC with attached fee schedule and insurance certificate. T. Nadobny seconded. The motion carried with all voting in favor. Mayor Schnabel highlighted the October police report. T. Nadobny asked Eng. Lipinski about the study; the report will be made at the February meeting. Supt. Sweitzer stated a wire became bare on one of the antennas and a spare was put in service. Control Systems 21 finished the project to send the sewer flows from the meters in Railroad Borough to the SCADA room but there are problems and the technician needs to return to correct the problem. The Borough’s share is 58% and the cost is less than $10,000.00. Certain Township representatives requested a meeting with the Water and Sewer Committee before the Township would proceed to adopt the ordinance. The Wellhead Protection Committee recommended that Volatile Organic Compounds be added to the testing requirements. December 19 at 7:00 p.m. was suggested as a meeting with Supervisors Solomon and Rutledge and Manager Zeigler. Med Ed contracted to have a test drill done in the area where a pole will be relocated during the Exit 4 work. The test drill was being done without the Borough’s knowledge on December 1 next to the Pumphouse. The contractor grouted the finished drill area. Met Ed does not have a right-of-way to perform any work in this area. Supt. Sweitzer spoke with a representative of Met Ed who said it will not happen again. It was suggested that Supt. Sweitzer check the area now and again in six months. Supt. Sweitzer said that during the water line project, it was discovered that homes in certain areas have old well piping for their water services and one home experienced a leak during the project. The Borough’s unaccounted water last year was less than 6% and if a lateral is leaking and it’s not metered, the Borough and the homeowner could be unaware of the problem. A policy will be put in place giving the homeowner a certain length of time to replace the unacceptable,black well pipe currently in place with a better psi pipe. R. Buchanan proposed to increase sewer rates by increasing the fixed charge from $45.00 to $55.00 a quarter plus increasing the tier rate charges for those using over 31,500 gallons. He proposed increasing the commercial/industrial/public fixed charge from $70.00 to $91.00 a quarter and then increasing the rate of tiers per thousand gallons. S. Walters moved to adopt the proposed rate schedule as presented. K. Wills seconded. The motion carried with all in favor. The clear sight triangle is violated when vehicles are parked along Crosswind Drive. Also, many vehicles do not stop at the stop sign on Covington Drive and drift through the intersection. The developer did not contract with the Borough to plow the portion of Ascot Drive that is unadopted. If he asks the Borough to plow, there are about $5,000.00 worth of improvements that need to be done. Supt. Sweitzer was asked to call the developer to see who will be plowing the street and about the improvements that need to be done. A letter will be sent to the approximately six home owners in this section about who will be taking care of the street this winter. S. Walters moved to authorize Supt. Sweitzer to call the developer and to work with Sol. Rehmeyer for a resolution. There is no tax increase but there is a sewer rate increase. T. Nadobny moved to adopt the tentative 2018 budget as presented. F. Arbogast seconded. The motion carried with all in favor. Eng. Lipinski submitted a recommendation of payment to Macmor Construction, LLC, in the amount of $118,630.30. T. Nadobny moved to pay Macmor Construction, LLC, in the amount of $118,630.30. S. Walters and D. Kraatz seconded. The motion carried with all voting in favor. Eng. Lipinski is waiting for PennDOT to return the driveway permit applications and checks. PennDOT is willing to meet to discuss the milling depth and what affect it would have on the height of the curbing, sidewalk, and drainage. It was proposed to meet on December 28 at 2:00 p.m. on site. Eng. Lipinski spoke with Gloria McCleary who is agreeable to the Borough performing the work and to reimburse the Borough for costs and labor. An existing sewer easement will be used to access the basin and discharge area. T. Nadobny moved to authorize the signing of the PennDOT permit applications for the water and sewer connections. S. Walters seconded. The motion carried with all voting in favor. TRG recommended in the traffic study that there be no left-turn lane traveling west on Route 851 to turn left into the development. Council was adamant that it does want a left-turn lane into the development to turn left from Route 851. T. Nadobny moved that the Borough does not agree with the proposal of TRG and that there should be a left-turn lane from Route 851 westbound into the development. F. Arbogast seconded. The motion carried with all voting in favor. The engineer was tasked to prepare a letter to that effect, with assistance from the solicitor. Eng. Lipinski did receive a proposal from ECS to perform the geotechnical study and it is within the cost parameters set at the last meeting. He is reviewing the proposal to make sure it addresses our concerns in order to move forward with the project. Gannett Fleming supplied a letter that states there will be some increase to the flood heights in the main channel of Deer Creek but don’t exceed 0.5 feet. They state the unnamed tributary that contains the Borough’s weir will not be impacted at all by velocity increases or by increased flood heights. The proposed ordinance was modified per the meeting of the Wellhead Protection Committee and will be discussed at the meeting with the Township representatives. The attorney for the shopping center asked more questions about developments in the area and existing inlets; answers will be supplied to the questions, based upon feedback from the superintendent of public works and the engineer. The Solicitor for New Freedom Borough is supposed to be arranging a meeting of the solicitors for the Boroughs and the Townships. A fully executed copy of the Lease Termination document was received. The superintendent of public works will check the building shortly after the end of the year. S. Walters moved to recommend approval of Resolution 2017-5 Prohibiting the Location of a Category 4 License Casino within the Borough. Sol. Rehmeyer’s office prepared the year-end tax ordinances for adoption at the December 27 meeting. Stewartstown Railroad Company and Omega Rail Management, Inc.
Additional billing was received and a follow-up letter was sent dated December 8, copy attached to report. Chief Myers asked that he be authorized as the authorized signature needed on running assignment changes in the district covered by the Shrewsbury Volunteer Fire Company as first due. F. Arbogast moved that Chief Myers be authorized as the authorized signature needed on running assignment changes in the Shrewsbury Volunteer Fire Company’s first due district. The field work for the 2017 audit will start tomorrow. K. Wills stated he observed a student walking to a bus stop along North Main Street walking in the road as there were no sidewalks in the area. Russ Palmer has resigned from the Planning Commission which was acknowledged by Council. T. Nadobny moved to adjourn the meeting at9:55 p.m.
S. Walters seconded. The motion passed with all voting in favor. Submitted by Cindy L. Bosley, Sec.